Asia, the far east. The Orient. A culture so different from the Western world. Different food, different customs, different ways of looking at life. Or is it? Video Night in Kathmandu looks at how America and the Western world slowly is seeping into Asia. Taking over their culture, fast-food chains outcompeting the local restaurants, American movies being remade in Bollywood. The author takes us on a tour of several Asian countries with stories told from often surprising and interesting angles. I have to admit, I haven’t travelled much in Asia. Apart from a few airports on my way back and forth to Australia, the only country in Asia I have visited is Japan. I tried it first, and kept on coming back. Asia is unknown for me, but I love reading about it. It is not a lack of desire that has kept me away from Asia, more lack of money and time. There are so many places to visit, and not nearly enough time. Iyer’s book did not lessen my desire to go there. Although the book is from the ’80s, and certainly a bit outdated, I found the stories from the different countries very interesting. Pico Iyer has a way of finding the interesting locals, those living on the edge of society, those with a story to tell. He is then able to retell that story in a very interesting way, keeping the reader hooked. I can only compare to my experiences on his chapter on Japan. Here he found himself in many similar experiences to mine, but it was also clear that the book was from the ’80s, and I could notice how the country had changed from then. 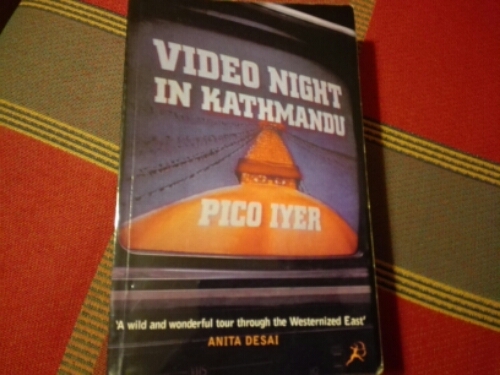 Overall, I found Video Night in Kathmandu very entertaining, it was hard to put it down at times. Iyer is able to find the truly interesting people and stories from places he visits, and retells them in a way that is easy to read and very entertaining. The book really intensified my desire to travel more in Asia. He also finishes the book nicely, with a thoughtful and well-informed afterword. If you are looking for travel books about Asia, Video Night in Kathmandu is a good place to start. This entry was posted in Book Review and tagged Asia, Pico Iyer, travel writing on May 8, 2015 by Traveltorgeir.